"Huebers Care" Senior Home: Built by Balthasar Neumann for the Senior Stall Master von Zobel. 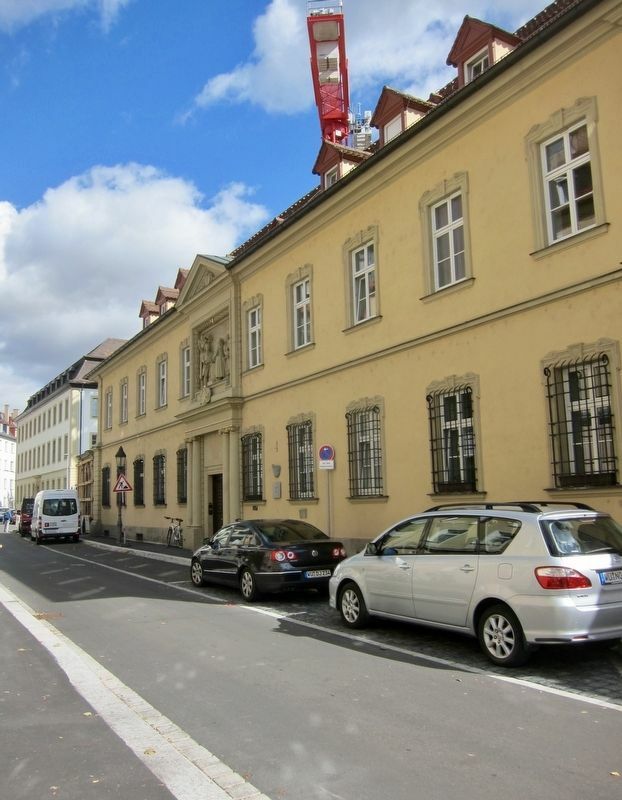 Since the end of the 18th Century has been a care facility for poor servants and maids with the support from a bequest by City Councillor Adam Josef Hueber. von Zobel erbaut. Seit Ende des 18. Jahrh. The relief above the doorway is by Balthasar Heinrich Nickel. Location. 49° 47.735′ N, 9° 56.364′ E. Marker is in Würzburg, Bavaria. Marker is on Kapuzinerstrasse just west of Hoffstallstrasse, on the left when traveling west. Touch for map. Marker is at or near this postal address: Kapuzinerstrasse 4, Würzburg, Bavaria 97070, Germany. Touch for directions. The marker is visible here to the right of the doorway. Helena Petrowna Blavatsky (about 90 meters away, measured in a direct line); Richard Wagner (about 150 meters away); Johann Georg Oegg (about 150 meters away); Hannsheinz Bauer, 1909 - 2005 (about 240 meters away); Theodor Drey (about 240 meters away); Julius Reichsgraf Von Soden (approx. 0.3 kilometers away). Touch for a list and map of all markers in Würzburg. 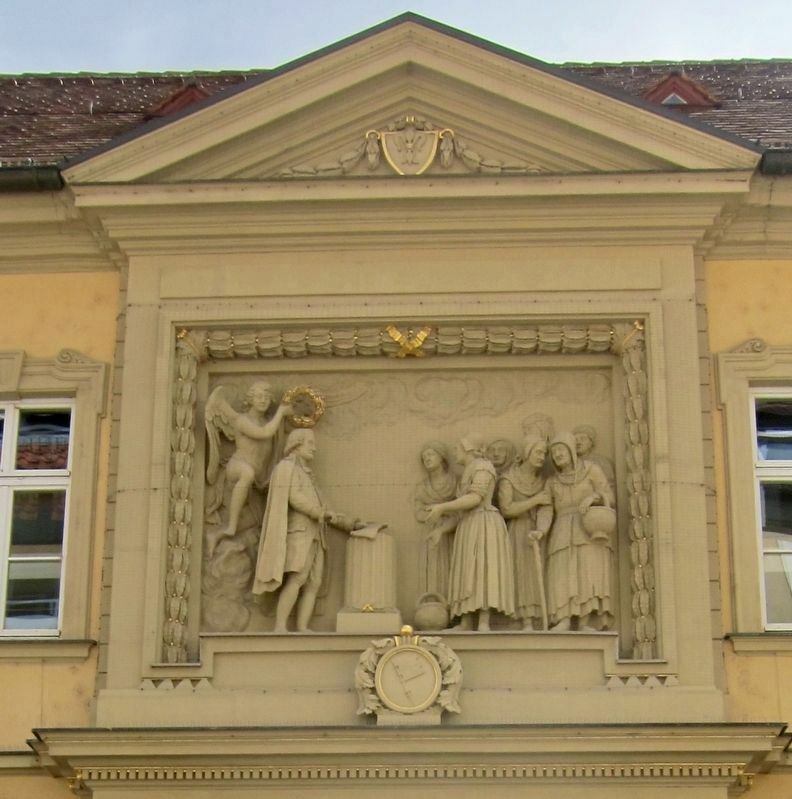 According to the WürzburgWiki, the relief shows Hueber dressed in his City Councillor attire, presenting the bequest papers, with a group of elderly maids looking on. WürzburgWiki also indicates that Hueber made the bequest specifically for elderly maids that had worked for more than 20 years Würzburg households, because women who worked their full lifetimes as maids typically were compensated with room and board but little cash (and as a condition of employment were to remain unmarried), thus leaving them with few resources at time of retirement. More. 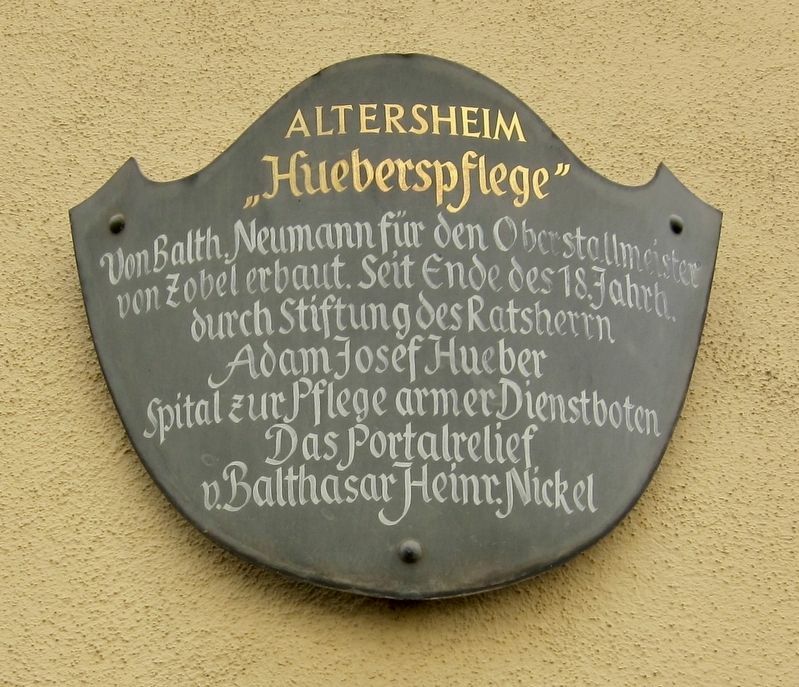 Search the internet for Altersheim "Hueberspflege" / "Huebers Care" Senior Home. Credits. This page was last revised on February 23, 2019. This page originally submitted on February 23, 2019, by Andrew Ruppenstein of Sacramento, California. This page has been viewed 53 times since then. Photos: 1, 2, 3. submitted on February 23, 2019, by Andrew Ruppenstein of Sacramento, California.